1. Hi Paula! Your new YA book, Shell, is out this month. Can you tell us a bit more about the book? Hi Zoe, It’s lovely to be on your blog. Shell is a psychological thriller about sixteen-year old Lucy Burgess who has terminal cancer. Lucy is preparing herself to face death, but one day she wakes up cancer-free and discovers, to her horror, that her parents have had a surgeon perform a body transplant on her. She’s now trapped in a donor’s body with only her brain and eyes left of who she was. As Lucy struggles to come to terms with this new body and having to now live a life she didn’t choose, she realises that cheating death comes at a price. Yes, Shell is darker than both The Truth About Celia Frost and Blood Tracks but I’m also a big believer in having hope even in the darkest of situations. Right from the opening page the physical, emotional and psychological journey that Lucy Burgess goes on in Shell is tough and intense but we see how Lucy faces up to the challenges. I also love reading good dark thrillers and I definitely enjoy writing in this genre as I can get my teeth into some meaty story-lines and try to create complex, intriguing characters. I love the intricate plotting involved in writing thrillers; working out all the twists and turns. The story is fermenting away in the back of my mind and it’s so satisfying if I have a Eureka moment and suddenly work out which way the plot should go or what a particular character should do. Thanks, Zoe. My initial inspiration actual came from my fifteen-year old daughter. One day she said to me, ‘What if rich people could pay to cheat death by somehow keeping themselves alive?’ This question intrigued me and it sparked off a train of thought that led me to researching body transplants. It’s a concept that is still in the sphere of science fiction. However, as I suspected, scientists all over the world are trying to make it a reality. I’ve been following one in particular called Professor Sergio Canavero, who has been trying to perform this procedure for years and is determined he’ll succeed (although he does come across as your archetypal ‘Mad Professor’). I find it a fascinating subject, riddled with ethical issues and one that encapsulates the primal desire, in many humans, to be able to cheat death. Once I realised that I wanted to write a dark tale about a dying teenager being given a body transplant Mary Shelley’s incredible Gothic tale played around my mind. Although Shell is different to the story-line of Frankenstein I was inspired by the novel’s concept of an arrogant scientist trying to play God by creating a life which was ‘against nature’. I wanted to put the focus of the narrative on the ‘creation’ and allow the reader to walk in the shoes of a girl who has been trapped in someone else’s body; a girl who feels she’s been made into a freak and would be rejected by society (just as Frankenstein’s creature is). I actually mention the novel within my novel as Lucy has to study Frankenstein in her English class and sees parallels between the creature and how she perceives herself. 4. Have you always like the classics? Is Frankenstein your favourite? Yes, I love many of the classics. For me, Dickens is the ultimate storyteller, but I’ll also reread Thomas Hardy (who admittedly is a bit depressing), John Steinbeck and Oscar Wilde. The literary achievements of the Bronte sisters leave me in awe and I love the wildness of ‘Wuthering Heights’. However, Mary Shelley’s Frankenstein is a particular favourite of mine. Even two hundred years after its publication it remains such an influential book. Its theme of the perils of scientists playing God seem to chime with each generation. It’s amazing to think that Mary Shelley was only eighteen years old when she started writing the story. She wrote it in response to a challenge laid down by Lord Byron when they spent a summer in a villa on the shores of Lake Geneva and were confined indoors due to unseasonal stormy weather. She really was ahead of her time. 5. What is the most challenging part of writing a book? 6. I think this book raises a lot of questions and I found myself overthinking everything once I'd finished. Did you want to write a book that left your readers thinking? Zoe, I’m delighted that you kept thinking about Shell even once you’d finished! I’d love readers to find the story thought-provoking as well as an entertaining thriller. 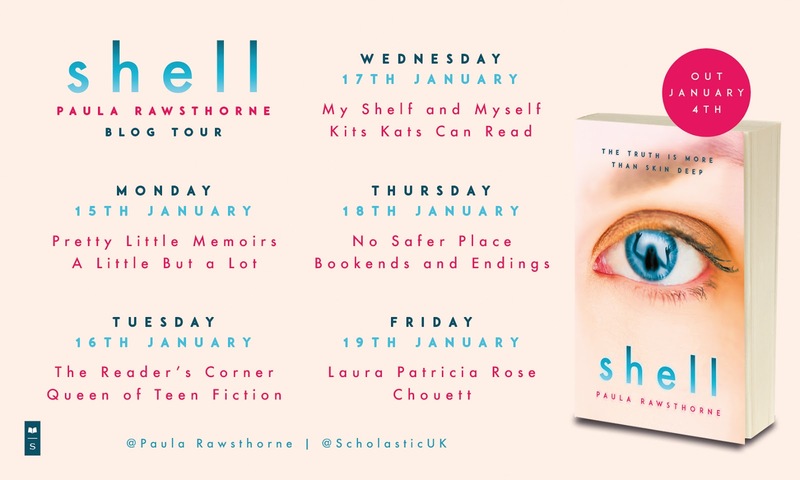 I’ve written Shell in first person, all from Lucy’s point of view, because I’m attempting to make it as immersive as possible i.e, to try to make the reader feel that they’re in Lucy’s head, so experiencing all that she’s going through in another girl’s body, having to live a lie. There are several themes running throughout the story including how far you’d go to stay alive, and how far would/should a parent go to save their child. There are also issues about how society treats you just because of the way you look and a complex relationship between Lucy and her mother and Lucy and her best friend but, at the heart of the novel, is the big question of ‘what makes us who we are?’ This is something that we all struggle with but for Lucy, trapped in another girl’s body, this question is the most difficult of all. 7. Which books are you recommending at the moment? Would love to know your current read! I’ve recently read Alex Wheatle’s ‘Crongton Knights’. I loved the vibrant use of language in this great read about McKay and his friends who live on the Crongton Estate. Alex deals with some serious issues whilst delivering an entertaining story. The last book I read was ‘Close Your Eyes’ by Nicci Cloke – a really well constructed plot, telling the story of the run-up to a (fictional) High School shooting. It feels realistic, unsentimental, tightly written and intriguing. 8. Last question. Do you have any advice for any budding writers? I suppose the best advice is to get writing. This may sound far too basic but, in reality, I come across so many people who tell me that they want to be a writer, or that they have a great story but they haven’t actually attempted to get it down on paper. If you feel passionate about a story then get it written. You can always come back to a rough first draft and make it better but, without something to work on, you’ll always just be someone who wants to be a writer. BIO: Paula Rawsthorne is the award-winning author of Blood Tracks and The Truth about Celia Frost. She first found success when she won the BBC National ‘Get Writing’ competition with her prize-winning story read on Radio 4. She has also been a winner of SCBWI’s ‘Undiscovered Voices. She is passionate about enthusing teenagers to get reading and is a writer in residence in a secondary school for the national literacy charity ‘First Story’. SHELL is her third novel for young adults.